Community engagement is an important part of the ethical conduct of biomedical research and in particular HIV cure research. 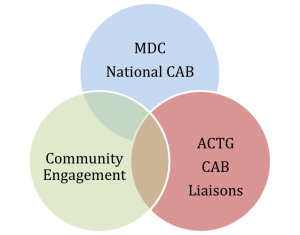 Community engagement is multi-faceted. Community advice and input is imperative so that all aspects of the research portfolio, conduct of clinical trials and engagement activities is responsive to local and national priorities and concerns. Since HIV cure research is relatively new, it is also imperative to increase the literacy of the community about the definition of cure in the context of HIV, HIV cure research methodologies and the associated challenges of discovering and implementing a cure for HIV. In collaboration with 2BeatHIV promotes community level integration of HIV cure science with medical care and prevention services. Represent CARE CAB interests and concerns regarding human subject trial for CARE protocols reviewed by institutional ACTG’s.